Hold on. Don’t quit reading. It’s not what you think. In an attempt to create a non-controversial column about Presidential inaugurations, I’ve chosen not to write this week about the one this nation just witnessed. 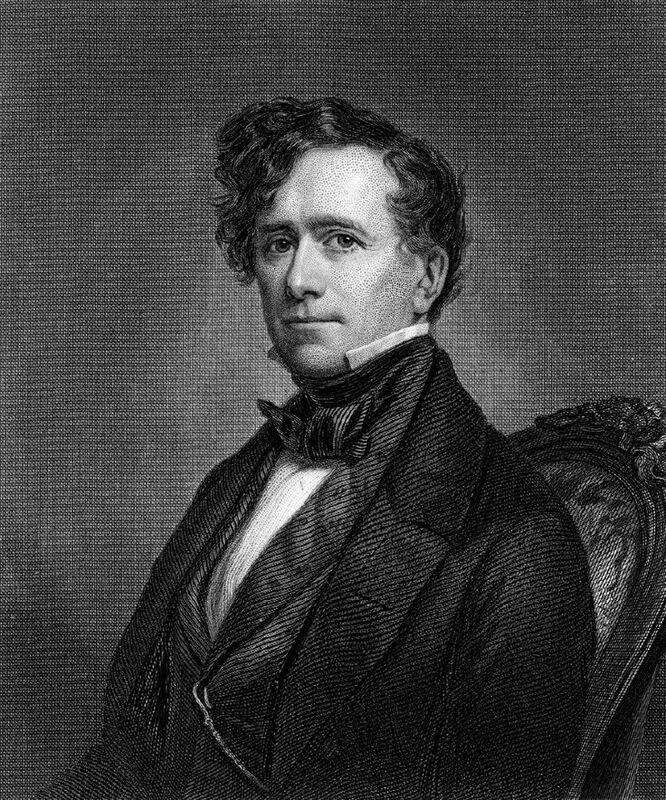 Instead, I’m harking back to March 4, 1853—the day Franklin Pierce became the 14th President of the United States. I grew interested in his inauguration when my friend Joan Tansil told me that her daughter Parish, who knows more about the personal lives of the U.S. Presidents than anyone I know, had pointed out that many historians consider the Pierce inauguration the worst ever. Not because the weather in Washington D.C. was so cold and snowy that many of the spectators didn’t even stay to hear Pierce’s speech. Not because of the unemployed workers who, in the first known protest at a Presidential inauguration, were staging their own counter-parade. Not because the Vice President-elect, William Rufus King, was too ill to attend. He was in Cuba trying to recover from tuberculosis and, with special permission from Congress, took the oath of office in Havana. King died in April at his home in Alabama, never having made it to Washington. No one served as Vice President during Pierce’s term in office. The Inauguration of 1853 was horrible primarily because the First Family was in deep mourning. Just two months earlier, President-elect Pierce, his wife Jane and their eleven-year-old son Benjamin were traveling by rail near Andover, Massachusetts. While speeding along at 40 mph, the train broke an axle and sent the Pierces’ coach careening over an embankment. The coach broke in two, crushing Bennie to death while his horrified parents looked on. His was the only fatality. Unfortunately, the Pierces were no strangers to grief. Their first child, Franklin Pierce Jr., had died in 1836 only three days after he was born. Second son Frank Robert Pierce died in 1843 of epidemic typhus at age four. Now they’d lost their only remaining child. Severely depressed, Jane Pierce did not attend the inauguration but remained at home in New Hampshire. She joined her husband at the White House at the end of March but spent much of her time writing heart-breaking notes to Benjamin. It would be nearly two years before she felt emotionally ready to receive guests at her husband’s side. Though she started the joyous tradition of having a Christmas tree in the White House, the Presidential home was, for the most part, filled with gloom and despair. And Pierce’s presidency is considered lackluster at best.